The full name of Ravenna’s immense cathedral or Duomo is the cattedrale metropolitana della Risurrezione di Nostro Signore Gesù Cristo. It is dedicated to the resurrection (anastasis) of Jesus Christ. The cathedral was built in the eighteenth century on the footprint of the Late Antique cathedral dating back to the late fourth or early fifth century. Even though it is a relatively new building, some elements of the older building – mostly later additions such as a campanile and some chapels – have been conserved. A visit to the Duomo is highly recommended, and free. The construction of Ravenna’s cathedral is usually attributed to bishop Ursus, and the original building is therefore often named Basilica Ursiana after him. The problem is that we do not know when exactly Ursus was bishop of Ravenna. Lists of early bishops that have survived are from a much later date and are not always reliable. Tradition holds that Apollinaris was Ravenna’s first bishop and that he was a disciple of Saint Peter. He was reportedly martyred during the reign of the Roman emperor Vespasianus (69-79). However, the first bishop of Ravenna who can definitely be considered historical is Severus, who held his office in the 340s. Mosaic of Bishop Ursus from the Sant’Apollinare in Classe. The dates for Ursus’ episcopate, which can also be considered historical, are given as either ca. 370-396 or 405-431. 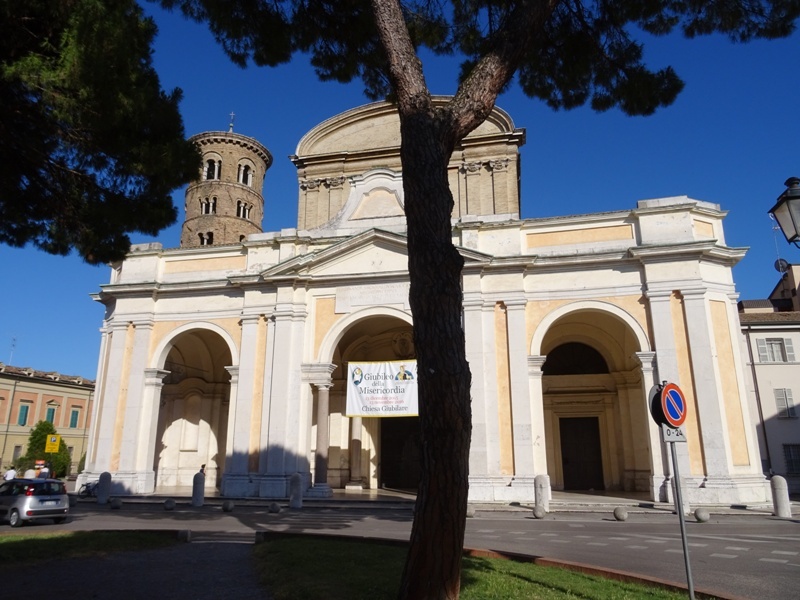 If Ursus was indeed responsible for the construction of the basilica that was named after him, he either commissioned it just before or just after the imperial court had been moved to Ravenna in 402. If Ravenna already had a splendid Christian cathedral before 402, this would have been an additional reason for the emperor Honorius to make Ravenna his new capital. If, however, the cathedral had not yet been constructed, then certainly the fact that the Western emperors now resided in Ravenna was a strong incentive to begin building one. We know that Honorius’ decision to move the court to Ravenna led to a building boom in the city and the construction of the Basilica Ursiana fits in perfectly. We also know that once Ravenna became the seat of the imperial court, the status of its bishop was elevated. The bishops were provided with metropolitan status at a certain moment in the fifth century. This status meant that Ravenna’s bishops held ecclesiastical authority over bishops in the surrounding area, which included cities such as Parma, Bologna and Imola. The Basilica Ursiana was a large rectangular building that measured some 60 by 35 metres. It had the shape of a classical Roman basilica, without a transept. Rows of columns divided the interior of the cathedral into a nave and four aisles, two on either side. Little of the original decorations, which must have been lavish and splendid, has survived. The ninth century priest Agnellus has left us a description of the basilica in his own days, from which we can conclude that the walls and ceiling of the building were decorated with precious stones, mosaics and stucco work. A campanile was added to the cathedral in the tenth century and it was fortunately left standing during the eighteenth century rebuilding project. The cathedral was provided with new mosaics in the early twelfth century and remains of these can be found in the Museo arcivescovile di Ravenna, which is located next to the cathedral. The mosaics apparently heavily featured Saint Apollinaris, the city’s traditional first bishop, but the cathedral was not co-dedicated to him (a chapel in the current cathedral is in fact dedicated to him). The nave of the Basilica Ursiana was renovated on at least three occasions in the tenth, fourteenth and sixteenth century. In 1727, archbishop Maffeo Nicolò Farsetti decided to have the entire cathedral rebuilt on the plan of the original basilica. The work was granted to Giovanni Francesco Buonamici (1692-1759), an architect from Rimini who had already worked on the San Vitale church in Ravenna. Buonamici was ordered to largely demolish the old cathedral and construct a new Baroque cathedral in its place. The project was begun in 1734 and construction was not completed until 1745. The new cathedral was consecrated in 1749. Although I generally dislike Baroque churches, I must say Buonamici did a very good job with regard to Ravenna’s cathedral. The interior of the Duomo is beautiful and so are the colours and the light. For a Baroque cathedral, the Duomo’s decorations are actually quite sober, at least as regards the nave and aisles (there can be some discussion about the chapels). which translates as: “Bishop Agnellus, servant of Christ, made this pulpit (pyrgum)”. The pulpit is decorated on both sides with 36 square panels featuring several animals, from top to bottom: lambs (Agnellus actually means ‘lamb’), peacocks, deer, pigeons, ducks and fish. A large decorated cross commissioned by bishop Agnellus can now be admired in the Museo arcivescovile di Ravenna, where one can also find the throne made for and named after Agnellus’ predecessor, bishop Maximianus (546-557). Cappella della Madonna del Sudore. In the right part of the transept, the visitor can find an interesting chapel, the Cappella della Madonna del Sudore, or ‘Madonna of the Sweat’ in English. The name refers to a small (35×23 cm) icon of the Madonna and Child that is kept in this chapel. It can be dated to the fourteenth century. The name ‘Madonna of the Sweat’ derives from a story in which a drunk soldier slashed the icon with his knife, causing it to miraculously sweat blood. 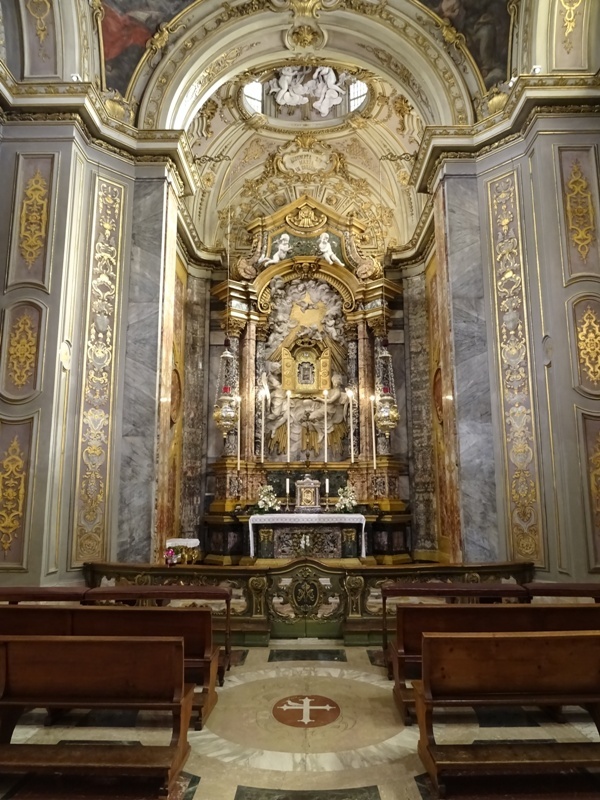 In 1630, the decision was taken to build a chapel for the Madonna del Sudore. 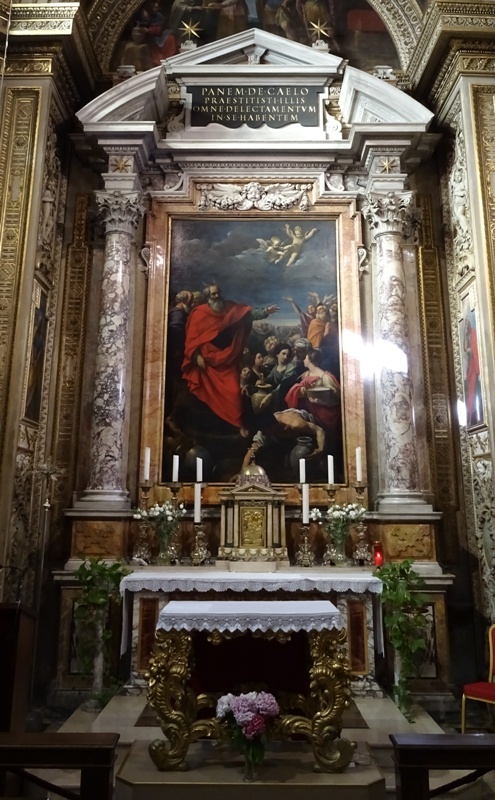 The icon itself – a painted tablet – is not much to look at, but the story is amusing and the chapel richly decorated. See the image on the left. The most interesting objects, however, can be found in the left and right arms of the chapel. On the right is the tomb of Blessed Rinaldo da Concorezzo, who was archbishop of Ravenna until his death in 1321. Rinaldo was a contemporary of the famous poet Dante Alighieri, who had been exiled from Florence and who died in Ravenna in 1321 as well. The tomb (see the image below on the far right) is actually a reused Roman sarcophagus from the early fifth century. It is decorated with a scene featuring three biblical figures. In the centre we see Jesus Christ on his throne, with a chi-rho halo surrounding his head and a book in his left hand. Saints Paul and Peter – the latter with a large cross on his shoulder – are approaching from both sides with a crown. The lid of the coffin has a simple decoration of scales. 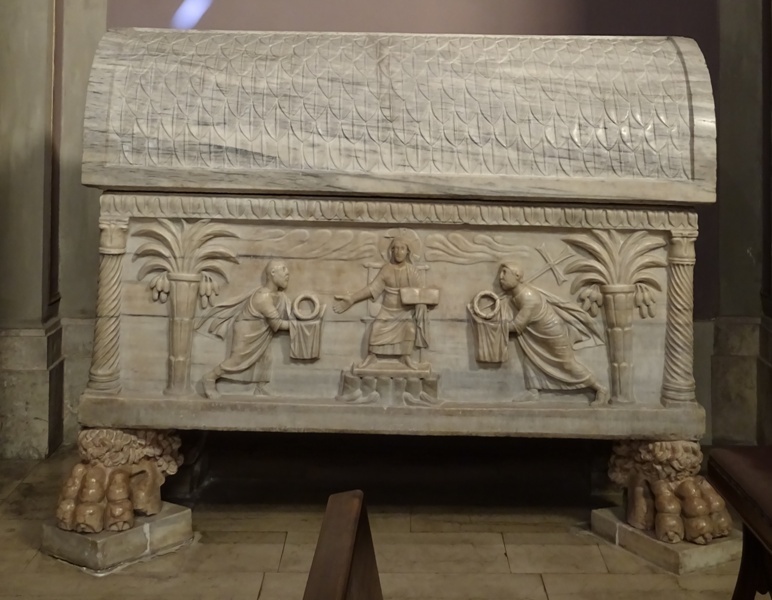 On the left side of the chapel is another fifth century sarcophagus (see the image on the right). It was originally in the church of San Lorenzo in Caesarea, built by Honorius (see Ravenna: San Giovanni Evangelista), and later transferred to the Basilica Ursiana. 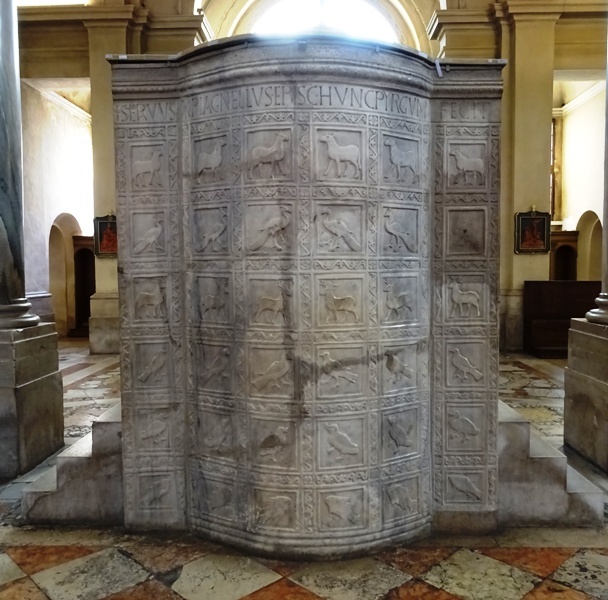 In the seventeenth century, the relics of Saint Barbatianus (Barbaziano di Ravenna) were placed inside the sarcophagus. He was the empress Galla Placidia’s confessor and apparently it was felt that he deserved a more splendid final resting place. 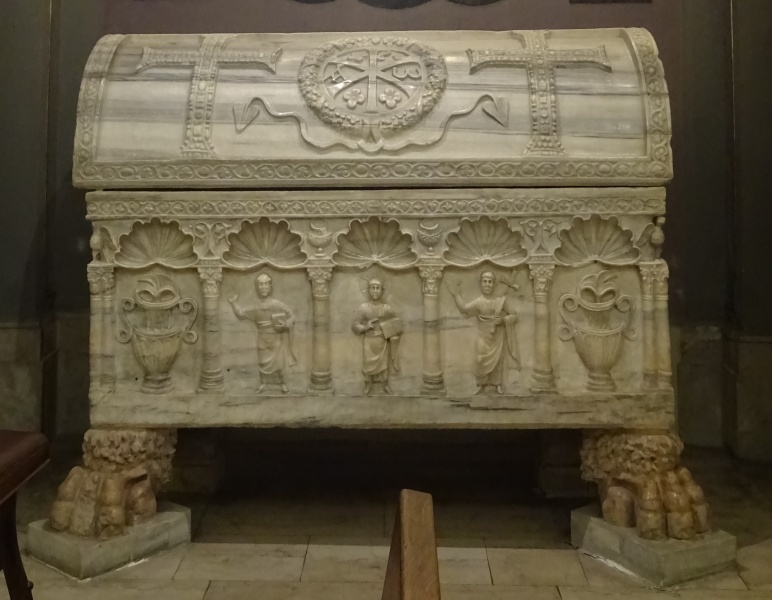 The marble sarcophagus is quite beautiful. Columns divide the lower part into five niches. In the central niche, we see Jesus Christ again, flanked by Saint Paul (with a book) and Saint Peter (with a cross). The outer niches are occupied by vases with plants. On the lid, we see the chi-rho symbol with the alpha and the omega between two jewelled crosses. Moses collecting manna amidst the Jews – Guido Reni. 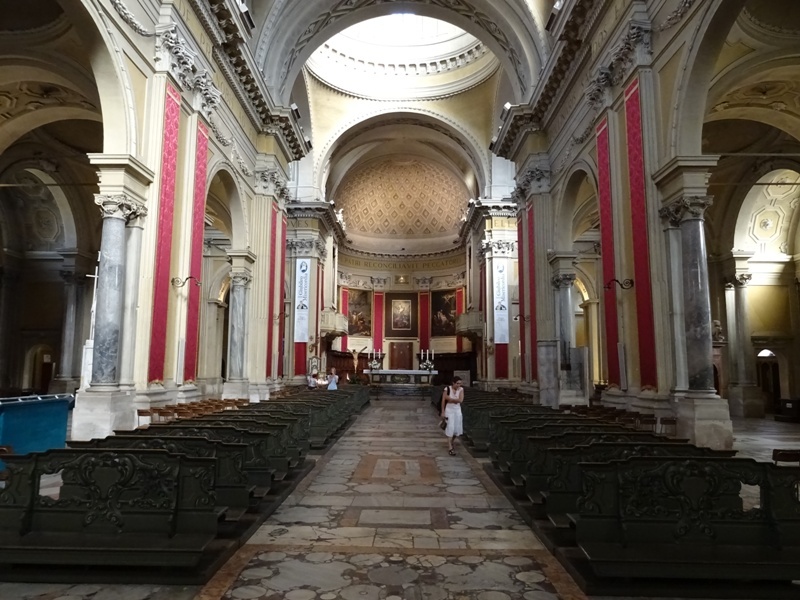 Finally, I would recommend a visit to the Cappella del Santissimo Sacramento on the other side of the church. The altarpiece Moses collecting manna amidst the Jews (301 x 203 cm, including the frame) is by Guido Reni (1575-1642), a Baroque painter from Bologna. The painting is based on Exodus 16 in the Old Testament. It was executed between 1614 and 1615. Moses appears to be having horns on his head, but these may actually be rays of light. The original Hebrew text of Exodus is apparently very difficult, and already troubled Saint Jerome when he wrote the Vulgate and – most famously – Michelangelo, who sculpted a Moses intended for Pope Julius II’s funerary monument with a couple of equally monumental horns.